The color white, although technically a non-color, is used more than any other color in interior design. Its pure hues evoke feelings of cleanliness, purity, serenity, and freshness. Although there are thousands of shades of white, ranging from pure white to dusty gray, any shade you choose will add crisp, stunning appeal to your interior. Take a look at 5 of our favorite white curtain ideas. No other color palette offers bold contrast like black and white. This sophisticated yet casual bedroom provides ultimate contrast between shades of black, gray, and white. Rich, black glossy floors, bed linens, chair frames, and accessories keep the room grounded with plenty of dark hues that provide depth. Slate-gray walls and a white ceiling and draperies balance the depth with light hues that keep the room open and airy. A black and white room always demands attention. This sophisticated color palette with warm, neutral tones provides a bedroom setting that’s chic, comfortable, and inviting. The dark, rich wood tones offer sharp contrast against the soft, taupe walls and the crisp white throw rug, chair, bed linens, and draperies. 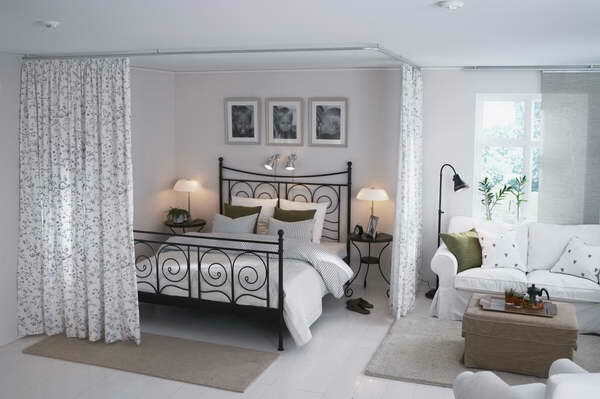 The soft white drapery fabric and the casual drapery heading help to give the room a casual yet sophisticated feeling. What little girl wouldn’t feel like a fairy princess in this beautiful bedroom? The soft, feminine color scheme of pink, green, and white creates a room with sweet, romantic appeal. The white furniture, upholstery, paint, chandelier, and draperies, all accented with pink flowers and ribbons, adds feminine charm and whimsical finishing touches to this pristine bedroom that’s perfect for any little princess. 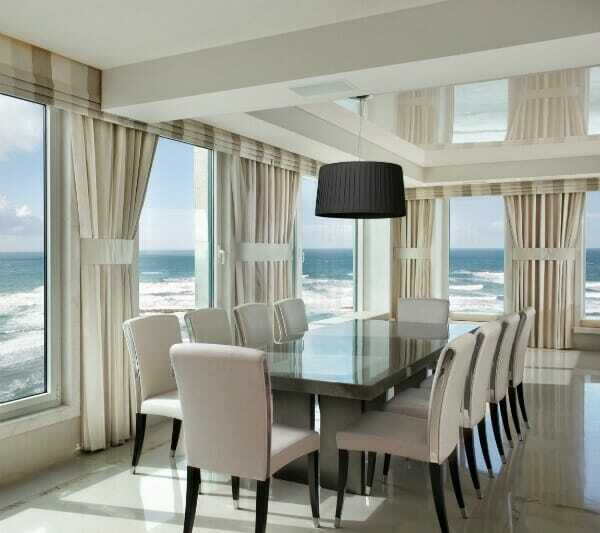 This modern dining room in a monochromatic color scheme is the perfect backdrop for this incredible ocean view. The hard, slick surfaces of the marble floors and stone table are immediately softened by the white chair upholstery and the elegant cream draperies. Since the view of the ocean waves rolling onto the shore is the main focal point here, there’s very little color in the room, other than a simple, striped valance in white, gray, and taupe that hangs above the cream draperies. If you have a loft or small living space, you can create privacy between areas with beautiful fabric room dividers. In this small apartment, a soft, white fabric with a subtle, gray floral pattern creates a simple curtain room divider that sections off the bedroom area when closed. It provides privacy for the sleeping area and adds visual interest to the entire living space, whether it’s open or closed. A beautiful curtain room divider is a great design solution for small living spaces.